This 5' X 13' deck has it all- strength, safety, and ease of installation on any pool. The deck is constructed of durable, maintenance-free resin. It is U.V. protected which will insure the strength and color for many years. The deck has a non-skid surface for safety. 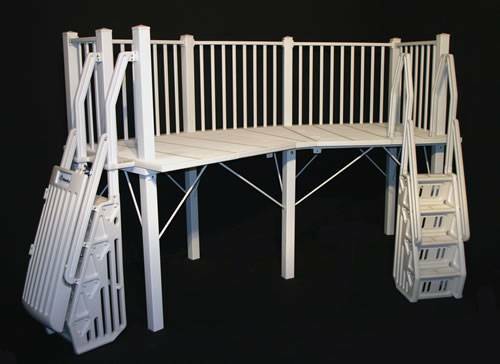 The underside is reinforced with a powder-coated steel bracing system, creating a super strong platform. It is easy to assemble and comes with complete instructions. Accommodates pools from 48" to 54". This Above Ground Pool Deck works on all round pools 18'-33' in diameter. Also works as an end deck on 18' wide or wider oval pools. Its unique design eliminates gaps between the deck and the top rail of the pool. The in-pool ladder and the ground-to-deck ladder are both included. The ground-to-deck ladder has a self-latching gate to prevent any unauthorized entry. The in-pool ladder has an anti-entrapment enclosure to prevent anyone from getting behind it. The unit comes with a 1 year warranty. Constructed of durable, maintenance-free resin. Accommodates pools from 48" to 54".